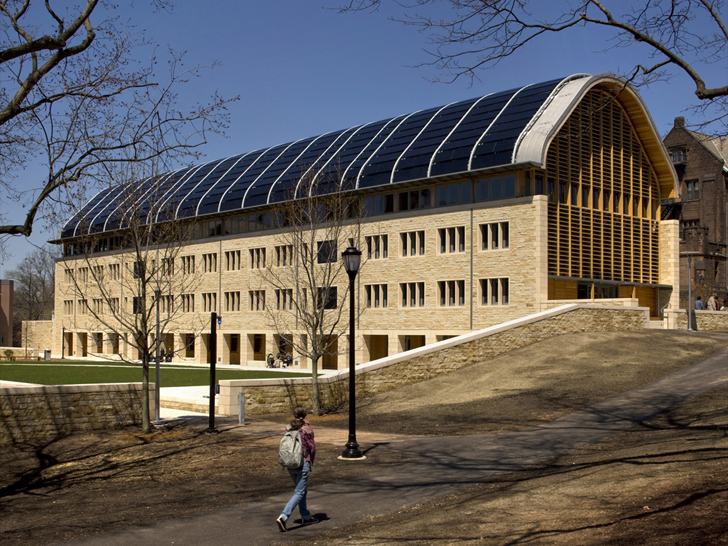 Reflecting the values of the Yale School of Forestry and Environmental Studies, which is located within its walls, Kroon Hall is designed as a model for sustainable building. To create this inspiring building, Yale brought together a dream team of some of the world’s leading architects and engineers: Hopkins Architects, Centerbrook Architects and Planners, ARUP, Atelier Ten, and The Olin Studio. Following Yale University’s sustainability mission, Kroon Hall is designed to use 58 percent less energy than a comparably-sized modern building. The building uses a very interesting technique to provide the heating and cooling: The lowest floor is set into a hillside with only its south side exposed, providing thermal insulation and minimizing northern exposure. The long south façade maximizes solar exposure during the winter. The tall façade is mainly covered with glass, ensuring that the interior gets as much natural light as posible. Light and occupancy sensors dim the artificial light whenever there is ample daylight. Half of Kroon Hall’s red oak paneling — 15,000 board feet —c ame from the 7,840-acre Yale-Myers Forest in northern Connecticut, which is managed by the university and certified by the Forest Stewardship Council and the Sustainable Forestry Initiative. Concrete is used all over the building to provide for insulation against temperature variations. Fifty percent of the concrete mix is blast slag, a postindustrial recycled material. An innovative system of ventilation, an energy-saving displacement ventilation system moves warm and cool air through an air plenum and multiple diffusers in elevated floors. Low-velocity fans in the basement keep the air circulating throughout the building. A 100-kilowatt rooftop array of photovoltaic panels provides about 25 percent of the electricity for the building. So one can safely say that Kroon Hall is an epitome of sustainability, using renewable energy in every form possible. Hopefully other universities will follow Yale’s lead, and we see many more innovative-yet-simple applications of green technology in architecture. Sorry to gripe but I expect more forwardthinking actually efficient solutions from industry. Leed needs a standard of building only qualifying with 12ft ceilings max(per floor unless dome). I could devise more efficient building schemes in minutes then I've ever seen LEED certify. All these big buildings are about aesthetics and the grants they can recieve by a architecture check list, not efficiency. Let's see a dome, 18ft high in it's apex/peak, with a floor underground, sensors channeling air between floors(for tempurature), a large amount of vegatation, light only where it's needed, masses of materials to retain tempurature(plants,water or stone),dual panel ventilation with fans, not just solar panels, but TRACKING arrays(as to not waste the materials like gallium needed to make panels), even a step further lets give those arrays lenses or reflective paint surroundings. I guess I expect the people with millions to think a 1/4 as much as a person with mere thousands..
High ceiling and mass lighting is not what I think of when I think sustainable. I think of small spaces for efficient cooling/heating and dim but direct LED lighting. Efficeincy isn't spaces, nor is the light far from it's destination. LEED is tacking it name on large buildings that fit certain criteria and less on actual efficiency. 100KW is 25% of the building use, for its immense size thats good but it's enough to power 20 homes of little efficiency. When you put things into perspect waste is waste. It uses a very interesting technique to provide the heating and cooling: The lowest floor is set into a hillside, with only its south side exposed, hence providing thermal insulation, minimizing northern exposure, and increasing the amount of natural light that enters the building from adjacent courtyards. The long south facade maximizes solar exposure during the winter. The tall façade mainly covered with glass ensures maximum natural light. Light and occupancy sensors dim the artificial light whenever there is ample daylight. 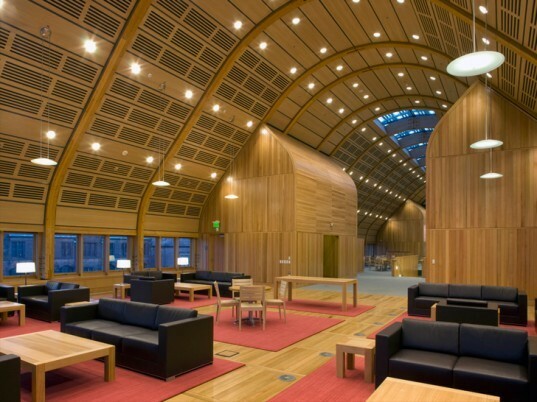 Most of Kroon Hall’s red oak paneling—15,000 board feet—came from the 7,840-acre Yale-Myers Forest in northern Connecticut, which is managed by the School and certified by the Forest Stewardship Council and the Sustainable Forestry Initiative. Concrete is used all over the building to provide for insulation against temperature variations. Fifty percent of the concrete mix is blast slag, a postindustrial recycled material. An innovative system of ventilation, an energy-saving displacement ventilation system moves warm and cool air through an air plenum and multiple diffusers in elevated floors. Low-velocity fans in the basement keep the air circulating throughout the building. A 100-kilowatt rooftop array of photovoltaic panels provides about 25 percent of the electricity for the building. So one can safely say that Kroon Hall is an epitome of sustainability, using renewable energy in every form possible. Hopefully this building should lead by example, and we see many such innovative yet simple applications of green technology in architecture.